creative solutions for how we might collectively address it. 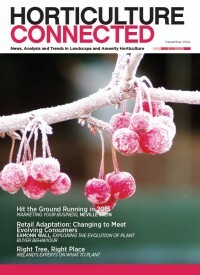 Adaptation: Changing To Meet Evolving Consumers – Eamonn Wall – plant manager at Arboretum Home & Garden Heaven, sheds light on how changing plant buyer behaviour is shaping garden retailing and providing opportunity for suppliers willing to adapt. New Perennial and Naturalistic Planting in an Irish Context – Verney Naylor MGLDA – cuts back the overgrowth to reveal how the New Perennial Movement is evolving in Ireland and how next year’s GLDA seminar may just define how we will be using plants in the next decade. Effective Pricing For Trees and Shrubs – Colm Kenny – Landscape cost estimating specialist, details a strategic approach to eective pricing of trees and shrubs for landscape works. Landscape Notes from Tel Aviv – Scott Renwick – a Landscape Architect working in Tel Aviv, shares his thoughts on pursuing a profession in a very di erent landscape. Hit the Ground Running in 2015 – Neville Stein – Marketing consultant Neville Stein articulates how a clear understanding of your business and the market can deliver sustainable growth in 2015. Trees To the Fore – Eamon Kealy – Sports turf management specialist, Eamon Kealy sheds some light on the planting and management of trees on Irish golf courses. Hairy Problem – Sam Belton – plant biology student at UCD shares results from commercially beneficial research he undertook as part of his undergraduate thesis.